We all want big boulder shoulders. You just need to take time on shoulder day to build a foundation strong enough to support those big PRs you see in your future. Throughout my lifting career, I've been lucky enough to avoid shoulder injuries. I am the exception, however. Shoulder issues are the bane of many serious lifters. Shoulder pain is often caused by muscular imbalances within the shoulder girdle itself. [1,2,3] Your rotator cuff muscles are constantly working to keep your shoulders stabilized during upper-body exercises. If you think about it, that means your shoulder girdle is working 4-5 days a week, even though you're probably not giving the muscles in the girdle any direct attention. This lack of direct training can be exacerbated by the fact that large muscles like the chest (pectoralis major) tend to get stronger much more quickly. As you increase loads, the demands on the rotator cuff and scapular stabilizers also increase more quickly, forcing them to play a constant game of catch-up. That catch-up game is where the danger lies: If you don't give those small stabilizer muscles direct attention, they're not going to be able to keep up with the progress of your larger muscle groups. Before you know it, your stabilizers become the weak link, limiting your shoulder development and becoming a major source of shoulder pain. Taking just 5 minutes before your workout to put these precautions into place can save you a lifetime of shoulder pain and limitation. If you're already experiencing shoulder issues, this prehab workout directly strengthens the stabilizing muscles of your rotator cuff, which will make a big difference in your major compound exercises—and in lessening any pain you might be feeling. With each of the movements in this workout, you directly target and strengthen these smaller, often-neglected stabilizer muscles. For each exercise, use weights between 2.5-5 pounds to avoid overloading the rotator cuff and scapular muscles. Lifting heavier weights will recruit the larger shoulder muscles, defeating the purpose of performing specific exercises to target the stabilizers. Start each rep by performing scapular retraction. Pinch your shoulder blades together and down, a position to maintain throughout the rep. This ensures that your rhomboids and mid-traps are isometrically contracting throughout the entire rep. Once you've completed a rep, relax your shoulders and allow your shoulder blades to reset before beginning the next scapular retraction. Optional exercises for the workout include internal and external rotations, which can be done using either bands or cables. If your cable machine allows it, use resistance in the range of 2.5-5 pounds. As you do these exercises, keep your elbow pinned to your hip. Perform 2 sets of 10-15 reps of both internal and external rotation. 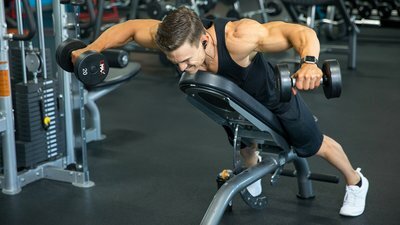 Do the cable exercises along with the incline dumbbell series, and you'll have a complete and effective program to keep your shoulders healthy! Gomberawalla, M. M., & Sekiya, J. K. (2014). Rotator Cuff Tear and Glenohumeral Instability. Clinical Orthopaedics and Related Research, 472(8), 2448-2456. Halder, A. M., Zhao, K. D., O'driscoll, S. W., Morrey, B. F., & An, K. N. (2001). Dynamic contributions to superior shoulder stability. Journal of Orthopaedic Research, 19(2), 206-212. Ben Kibler, W. (1998). The role of the scapula in athletic shoulder function. The American Journal of Sports Medicine, 26(2), 325-337.